No Plateau in Sight: A personal account of the refugee crisis. Being in the midst of this present day refugee crisis and just around the corner from many places of news interest, I recently chose to go to Munich, Germany and Tovarnik, Croatia to experience this history in the making for myself. September 12, 2015. The arrival of 12,200 refugees in Munich Hauptbahnhof (the main train station in the city) made for a total of 63,000 arriving Munich in 13 days. 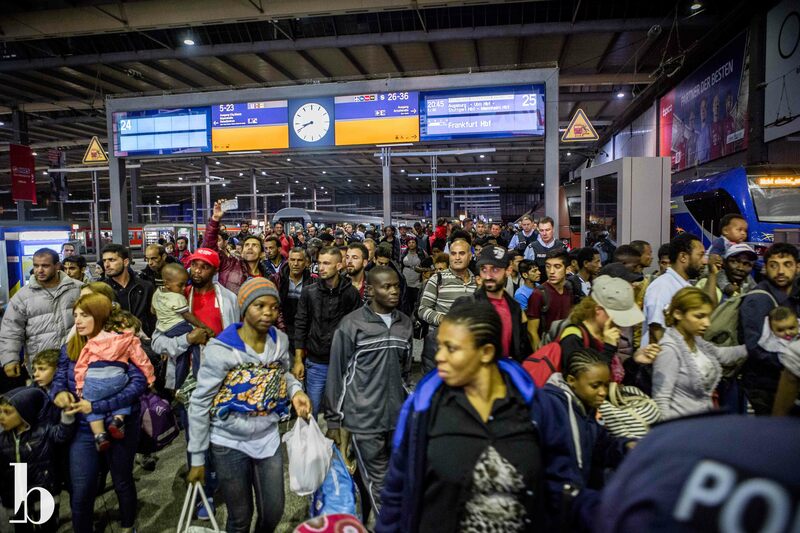 It was the next day, days before the world renowned Oktoberfest was set to commence, that Germany started to become concerned and halted trains coming from Austria that were bringing these refugees in by the masses. On the evening of September 12th, 2015, as I documented some of the newly arrived 12,200 refugees in Munich Hauptbahnhof sleeping on the floors of the train station, one particular family of six (husband, wife, one boy, two girls and an infant) stood out. The children revealed darkened-rimmed eyes, delirious and dazed from exhaustion, while the parents stood silent, starring blankly into the distance. I approached them and quickly found out that they spoke only a few words of English, but they made it understandably clear they did not want their photo taken. 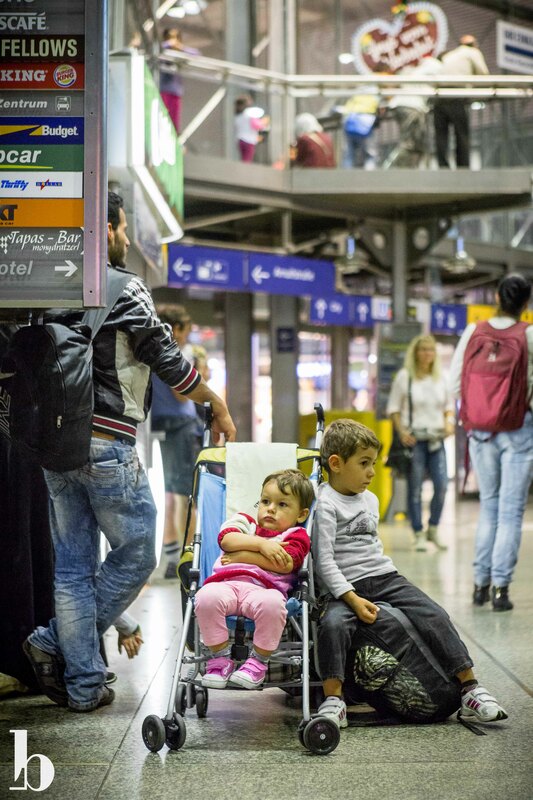 This family was from Syria, fleeing war and IS, and they were waiting for their next train to Dortmund, Germany. Because of the language barrier to communicate, I stood there in silence with them. I looked over to the wife carrying her infant in a baby sling, and she began to well up with tears. All I could do was grab and hold her hand, stare into her grief-stricken eyes, cry with her and pray a silent blessing upon them. Half a minute later it was time for me to move on and let them be. I couldn’t stop my tears from resurfacing the remainder of the night. A few minutes in that family’s presence has completely changed and humbled me in ways I still cannot put into words. I know absolutely nothing of what these refugees have been through, but I literally felt a bit of their grief and fear, and it continues to be overwhelming to me. A family of five, almost six, is cleared to board the bus after completing the registration process at Munich Hauptbahnhof. On September 17th, I set out alone for a very long and interesting bus ride from Stuttgart, Germany to Tovarnik, Croatia. Eighteen hours later, after trekking through Austria, Slovenia and a great deal of Croatia, being pestered by a young Croatian man sitting next to me, seeing two body bags lying beside an unrecognizable mangled automobile on the highway, being the only American passenger who held up the trip at border crossings, and at our last stop, sitting over a cup of coffee with the two Croatian bus drivers, I finally arrived. The line of refugees arriving by foot into Tovarnik from Serbia faded far into the horizon. They were parched from the intense heat the sun provided, and happily relieved and cooled themselves off with a running garden hose hanging from a farm fence along the way. Many relief workers were also handing out countless bottles of water. Tovarnik, Croatia lies about 800 meters or a half mile away from the border with Serbia. It is where the refugees were pouring in and making their onward journey north since Hungary hastily closed and fenced off their border with Serbia days before. 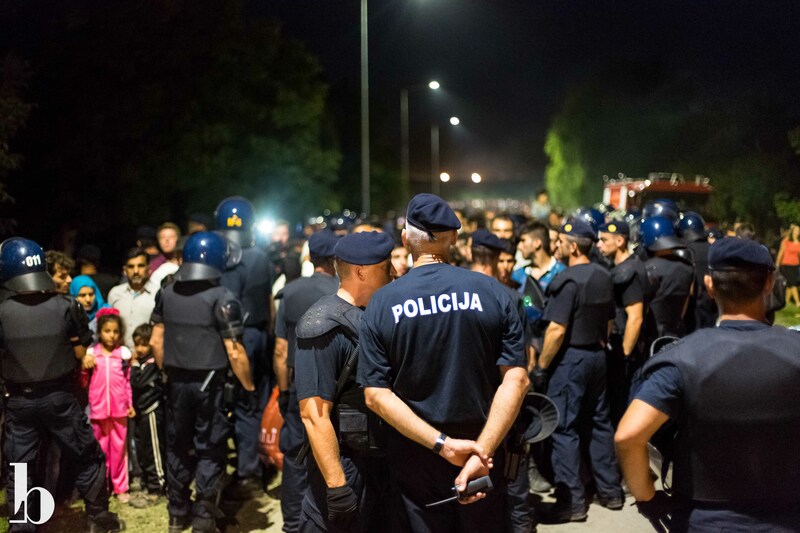 In a matter of three days, an overwhelming 20,000 refugees unmanageably poured into a willing but unequipped Croatia. 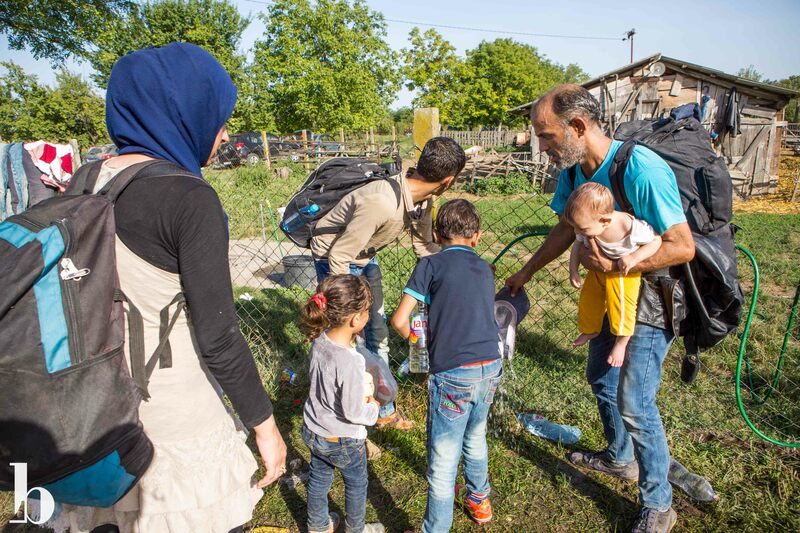 Dumbfounded, Croatia quickly resorted to closing their borders, yet were futile in preventing the thousands of refugees fraught with survival on the Serbian side from overtaking the guards. Because of the shade many trees provided in this particular spot, it made for a good rest stop, allowing families to regain a bit of strength and energy before continuing on. 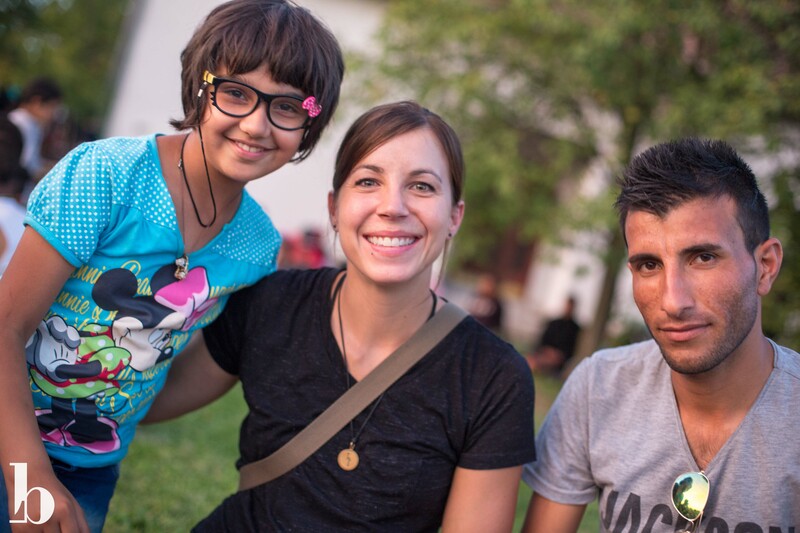 It was there that I met Samira and her family, making the journey from Iraq. 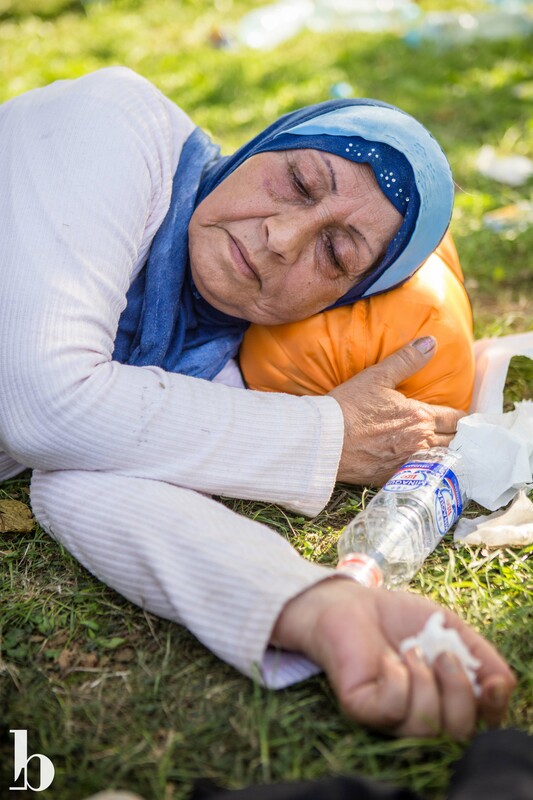 Samira, being an elderly woman, was sick from the long trek and lying down to rest on the heavily littered grass. I was invited to sit with them and immediately taken aback to see Samira taking her rolled up sleeping bag that she had been using as a pillow, and insisted that I use it as a cushion to sit on. Next, she and her family members all offered me their fresh bottles of water that they had just received. I was caught off guard by their caring and generous hearts to offer me the best of what little they had. 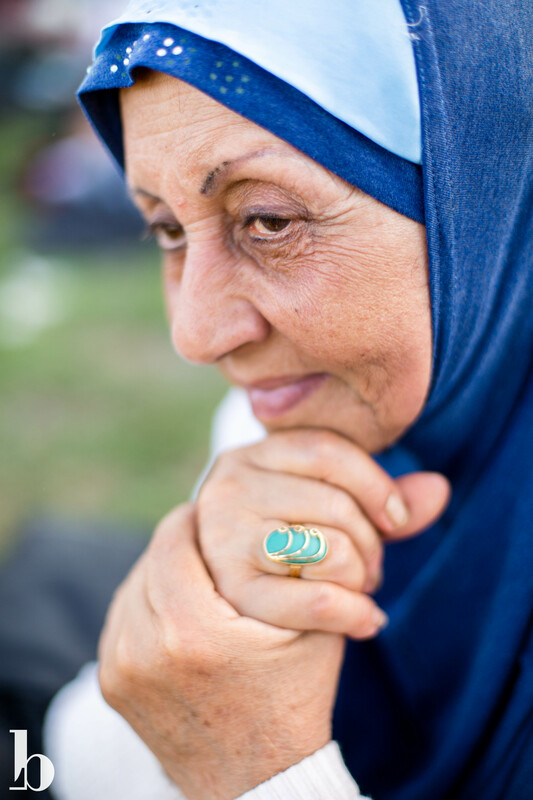 The family spoke very broken English, so it was difficult to for us to understand each other, but every time I made eye contact with Samira, her face illuminated with a smile and she would squeeze my hand as she held onto it. Samira taking a rest with her family. After about 20 minutes, it was time for them to move on, and I joined in the next part of their journey. We found a volunteer with a van who offered to drive Samira about a mile down the road to where the refugees were stopping and waiting for instruction of what to do next. 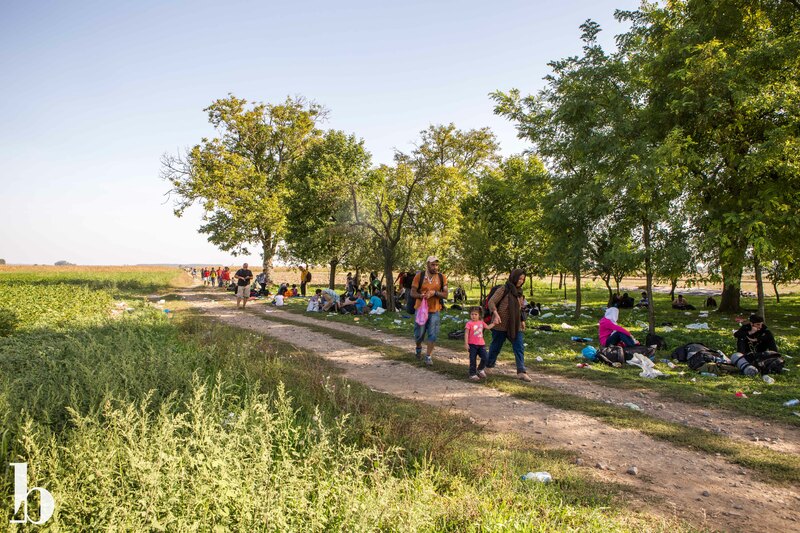 Thousands of refugees filled the once empty farm land; sitting, resting, rehydrating and waiting. Many charged their phones in an electricity station provided by volunteer relief workers in order to communicate to family and friends. Walking dazedly, wondering how to capture the weight of this scene, my attention was interrupted by a group of young men who wanted me to take their photo. One of them, Hashem Hamed, from Damascus Syria, on his way to Germany, spoke fairly good English. He kindly escorted me around the grounds, as like a guard, assuring people it was okay if I took their photo. He informed me that many of the refugees did not want their photo taken because they were ashamed of their current state of unclean hygiene from not having access to bathing for days or even weeks. In addition, particularly for the women, it’s a cultural shame and disgrace to be shown publicly in photos. We sat with a pair of ladies on their way to Denmark, before being invited to sit with some of Hashem’s family sitting nearby. 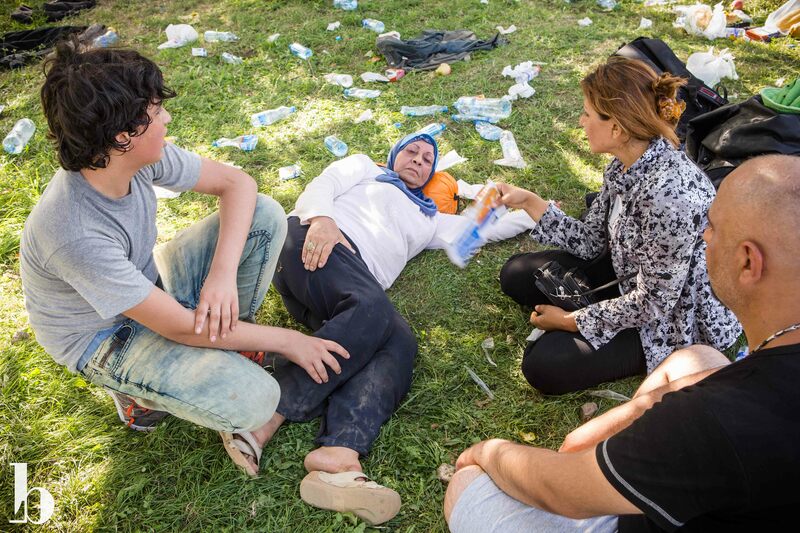 Again, like with Samira and her family, I was offered the food and water that they had, and directed to sit on the blanket. Hashem Hamed, his sweet 10-year old cousin, Shangul Lasmall, both from Damascus, Syria, and I sat together among 6,000 other refugees waiting further instruction of what to do next. Sitting with them, watching as dusk took over the sky amidst thousands of despaired, exhausted souls wondering what was next in their journey, I, too, was burdened with the same unanswered question. Then suddenly there was loud disorder and a mad rush of movement pushing down the road. 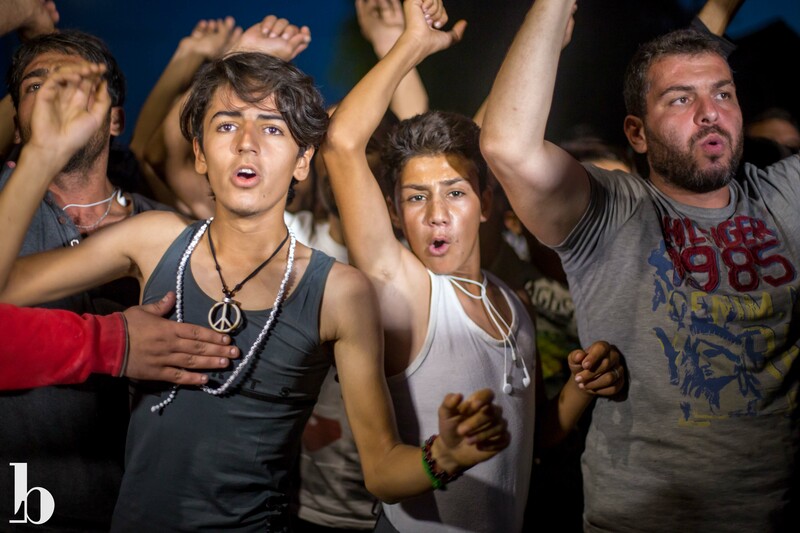 Two buses had arrived to transport a lucky 150 of the 6,000 refugees. Where to? Nobody seemed to know. Imagine the desperate scene: rallied cries of “WE NEED BUS! WE NEED BUS!” came from determined young men to make it onboard, babies and children crying, families scrambling to gather their belongings, find one another and stay together, women pleading the chance for their families to board, truck loads of Croatian police officers arriving to keep order and peace, and a multitude of media photographers and videographers franticly moving around to capture the new development. The scene remained calm. 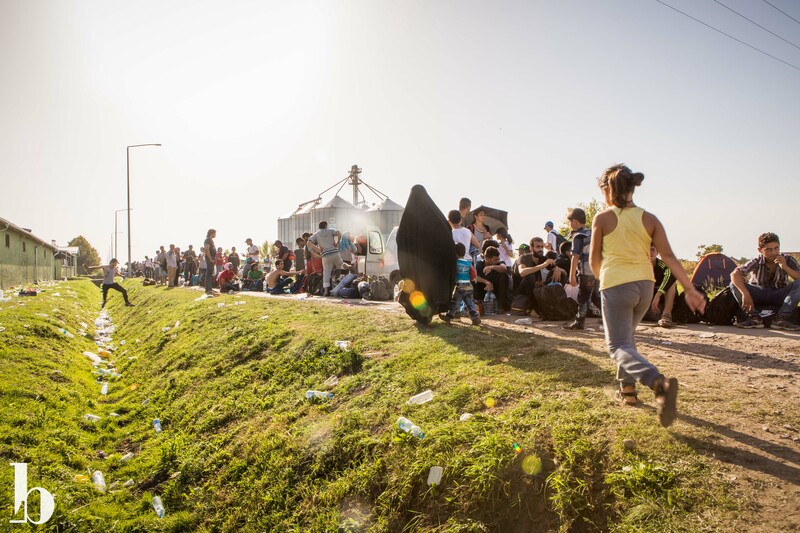 After the two packed buses departed, the thousands of remaining refugees lined up nearly a mile down the road continued standing in hopes that more would arrive. Of all the reporters I asked, no one knew where the buses were going, nor if any more were coming that evening. Nobody seemed to know anything the entire day – it was mass confusion causing increasing anguish and anxiety amongst the refugees. I’m not sure if more buses arrived that evening; I had arranged to be picked up from my hosts at a certain time. I was thankfully able to relocate Hashem and his family, bless them on their journey and say goodbye. I felt a heavy burden of guilt and sorrow as I walked away from them, knowing that I had access to a ride to get to where I needed to go and a bed to sleep on that night, while all of these refugees were likely going to sleep on the ground, continuing to wonder what next and if they were ever going to make it safely to their new home. Thousands of refugees remain lined up nearly a mile down the road in hopes that more busses would arrive. The mass swarm of refugees fleeing war from Africa and the Middle East to seek a new life in Europe seems to be multiplying with no plateau in sight. It is a crisis gaining momentum in numbers and largely out of control, which has sent an unprepared, unequipped and divided European Union chaotically scrambling to hold onto the reigns of control. What was once advertised as open, welcoming arms, has now gone to suspicious, closed doors and inspecting through the peep hole. Consider when Peter got out of the boat and walked on the water to Jesus. Peter went without thinking because it felt right and he had no reason to fear. After a few steps he became afraid, realized he was doing something humanly impossible and he began to sink as he doubted. In the same way, a handful of EU countries, primarily Germany, genuinely welcomed the refugees because it was the right and good thing to do, but they didn’t think ahead to how many could possibly come, nor did they communicate and agree upon a plan of action together. As the EU has realized they’re “walking on water” with their generosity, they’ve been quickly sinking in fear. There are predictions and opinions circulating that the real numbers have yet to show their face, or in other words, this is just the beginning of the crisis. Many EU countries have a “hands off” attitude and will not consider taking in any of these refugees. This is leaving countries like Germany in a vulnerable and tough spot, having to step back in order to catch their breath, redefine their boundaries and figure out a solution. I admire and respect Germany’s soft and warm heart of being willing to generously take in so many of these refugees under their wings. I find this an interesting visual in stark contrast with much of the world’s impression of the German people as unfriendly, cold and harsh. Germany is the only country known as the father land, while many others are referred to as the mother land. What a powerful picture this illustrates of a father taking in adopted children and covering them in provision, refuge and love. These refugees are human beings, people like you and me – men, women, children, husbands, wives, fathers, mothers, sons, daughters… They are people who have been faced with a tough decision to either stay and face death and persecution in their war-torn homeland, or let go of utterly everything they know and embrace the gift of life. They are taking the biggest leap in risking everything to survive, and who of us wouldn’t do the same? And now it is as if they have become burdensome numbers who have crossed well beyond the line in wearing out their welcome. What other choice do they have? The EU is desperate for help and a solution in this crisis. Closing the borders is not the answer – the refugees will find another way in. It’s like damming up water; you can’t stop the flow of water – it will find an alternative way to flow. Saying no to these despaired souls only fuels their determination and passion for survival. If they don’t make it in, then they are going to die trying. They have nothing to turn back to. I, personally, have been stumped on what is a good, balanced and healthy solution to this crisis… I have absolutely no idea. I can, though, see from both sides. My heart is with these refugees, especially after spending time with a small number of them, yet I see it’s not possible for only a few EU countries to healthfully handle this surge without drowning. All I can do is pray and hope for much wisdom and unity upon our world leaders in working together to find a resolution. What an incredible journey you are having to show the world what the other parts have to endure. Keep safe and keep sharing.